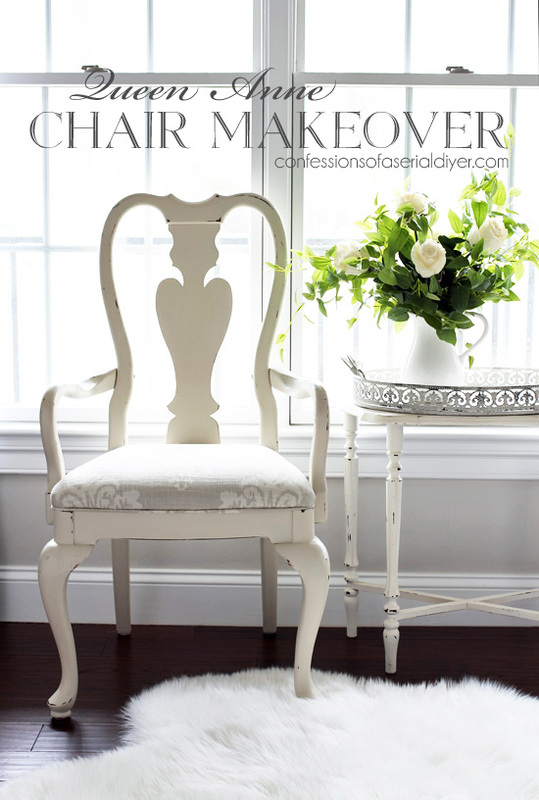 Today I’m back to share the chair that I redid to make it a set. However I already had a ton of photos to share that day, so I decided to share the chair separately, and today’s the day! It has just been sitting in our garage ever since. I promised my Hubby that I would eventually find a use for it and yay I finally did! It’s kind of hard to tell in that photo, but they look much closer now. 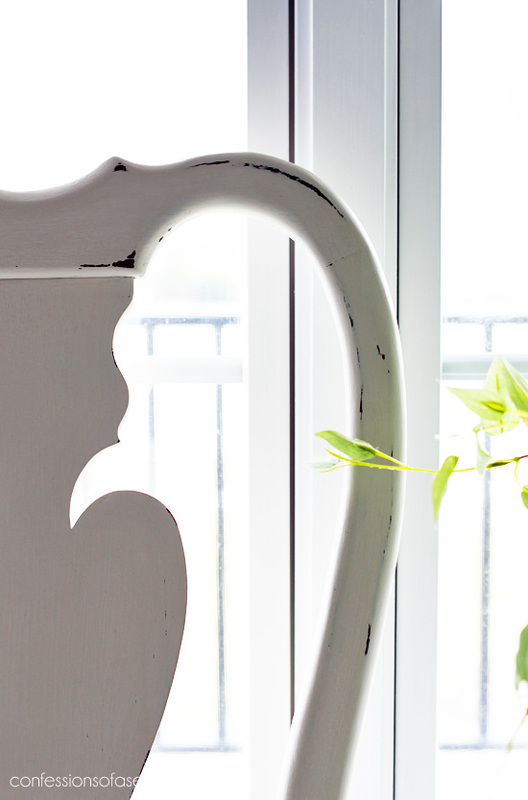 I lightly sanded here and there and sealed with Annie Sloan’s Clear soft wax. 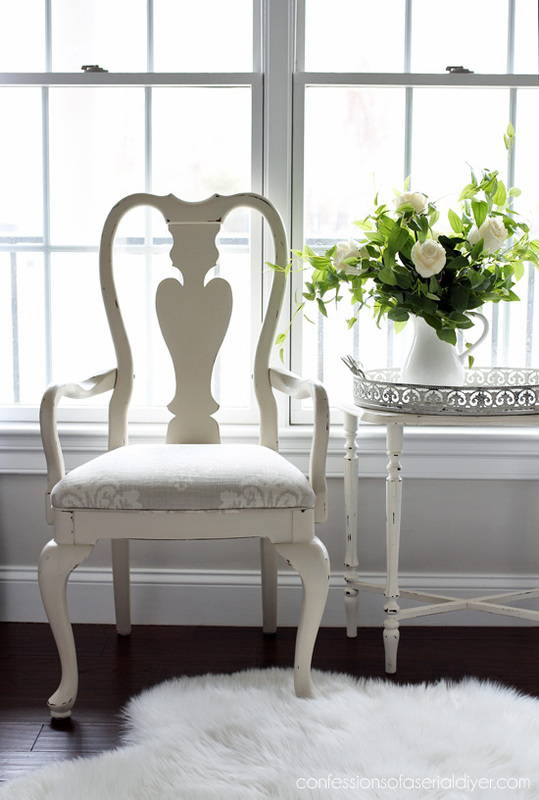 See my how-to for making and adding piping to chairs HERE. There is a SEW and a NO-SEW version! I dropped this set off at my booth on Saturday. 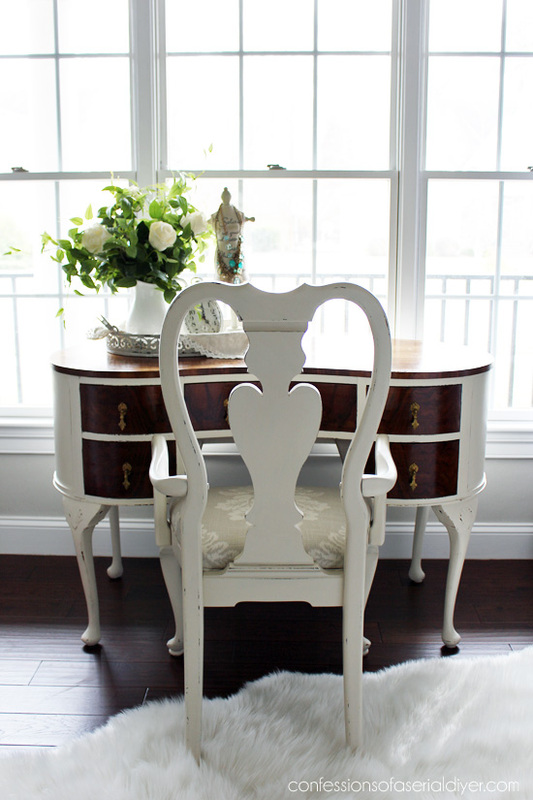 I decided to price the chair separately just in case someone wanted a more petite chair for this dressing table, but I think they work well together! Not too shabby for a $10 thrift store find that I bought for a spooky display! 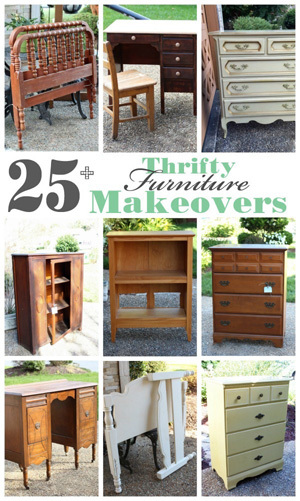 Meet me back here on Thursday…my Furniture Fixer Upper Girls and I will have even more furniture flips to share! 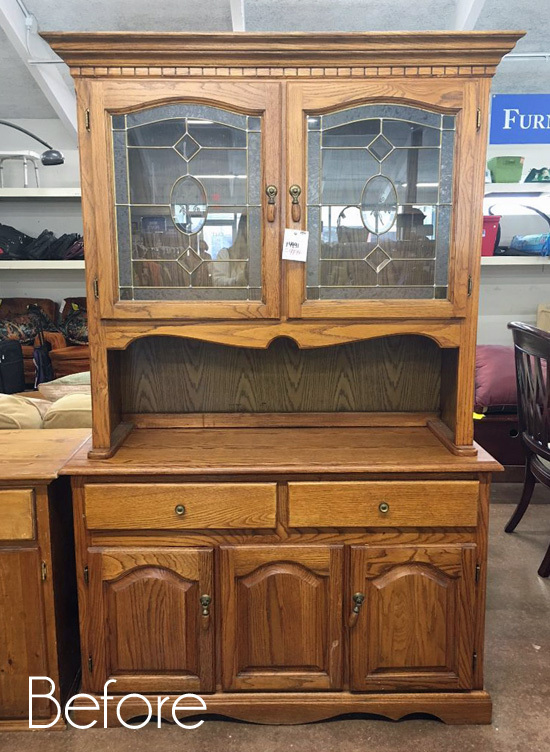 UPDATE: See how this beauty of a hutch looks now HERE! 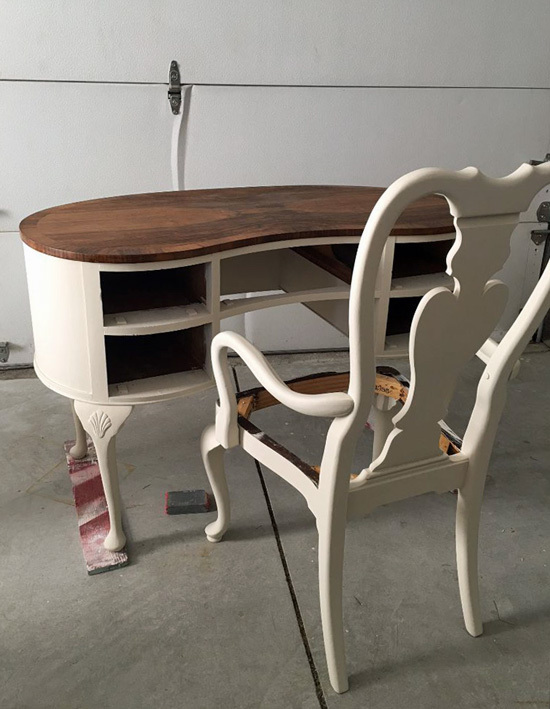 Desk and chair; Perfect match. 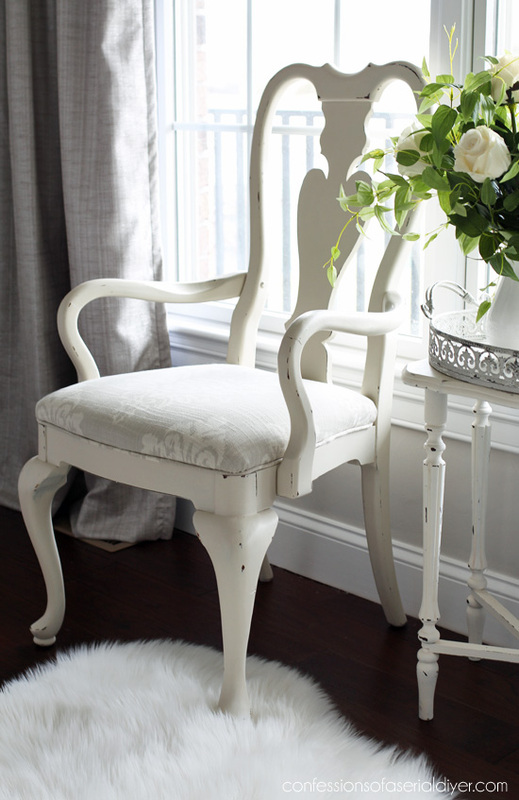 Absolutely love the looks of the ‘angel wing’ back chair. 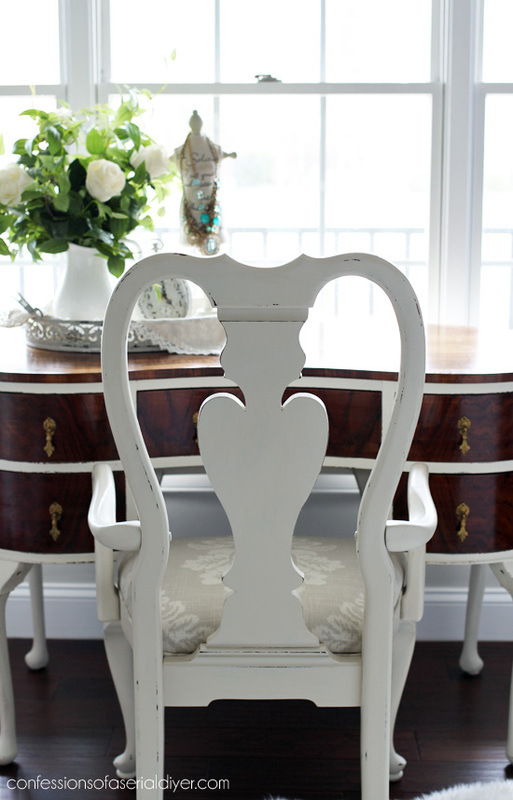 Back section of chair looks like an angel wing to me. At first thought a heart design but the more I looked at it; the more it looked like angel wing. Like the looks of the glass in that hutch. 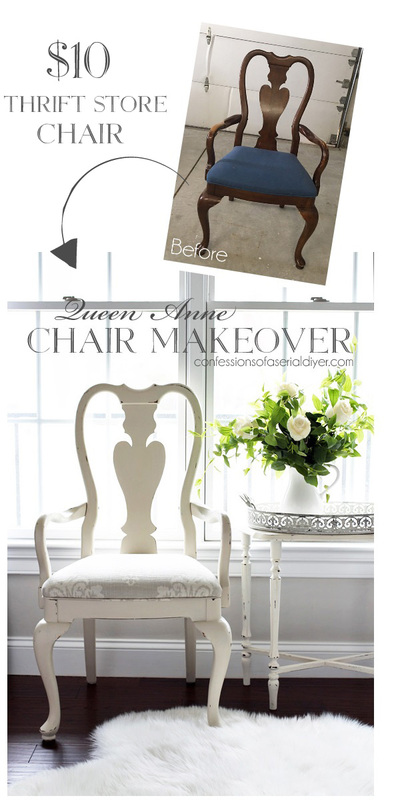 What a beautiful makeover to wake up to this morning! Love the color and interesting how one color can look so different on two pieces. 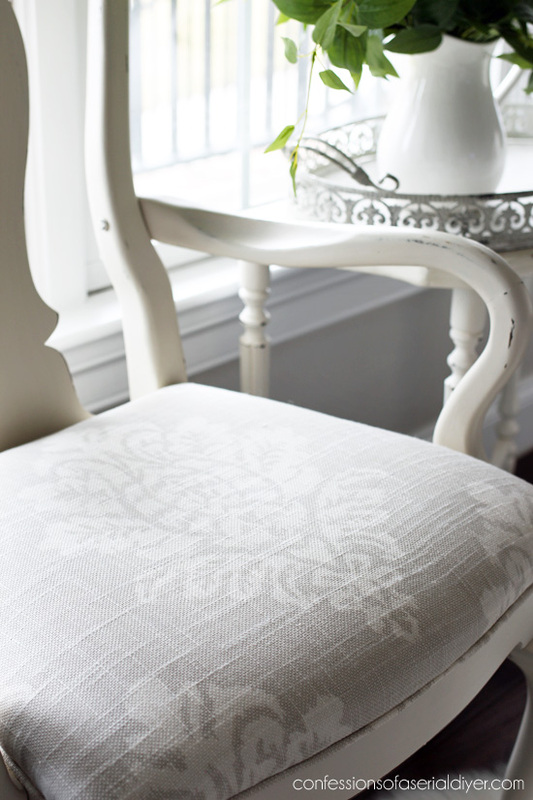 The fabric is perfect and the piping is a great finishing touch. 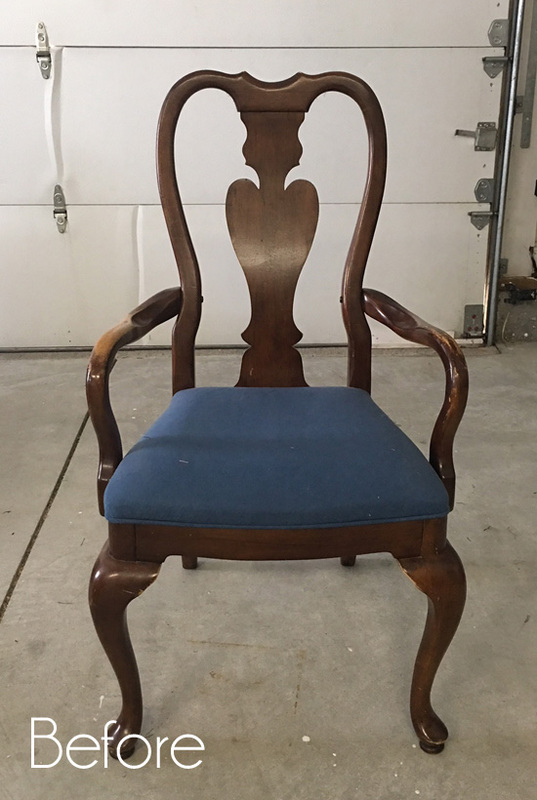 I know you said you are filling up your booth but I bet this chair, and others, sell fast! I’m looking forward to this next project. Boy, you have a niche in the area of renewing life in old things!!! Love it, Christy! Looks great with your beautiful table. The fabric is great choice. You really have an eye for color and design. 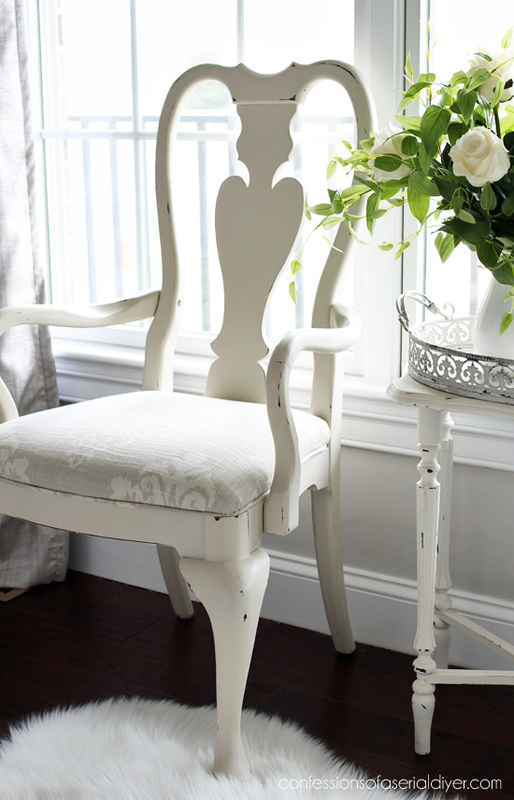 Love the sweet chair with the desk! Great job! Can I ask what kind of shades you have on the windows? I wish I lived closer to your booth! That pretty duo would be comin home to mama! It is so beautiful! They are beautiful together, Christy. That chair was a great score! I never thought about reusing the cord for piping – thanks for the idea. You better keep filling the booth, because this pair isn’t going to last long. I love everything you do and you’ve helped me learn! I want to paint a chair that has a nap, how do you think that will work? I also stained the legs with an oil based stain and now I think I will want to paint them with chalk paint…will that be a problem? Any advise you can give me will be appreciated. Many of your pieces are so lovely, I would think you would have a hard time putting them in your booth! 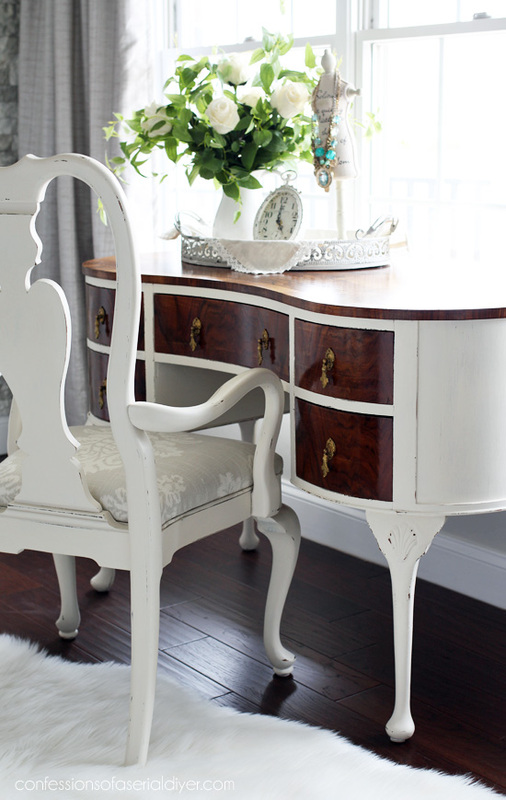 The chair is perfect for the desk/vanity! 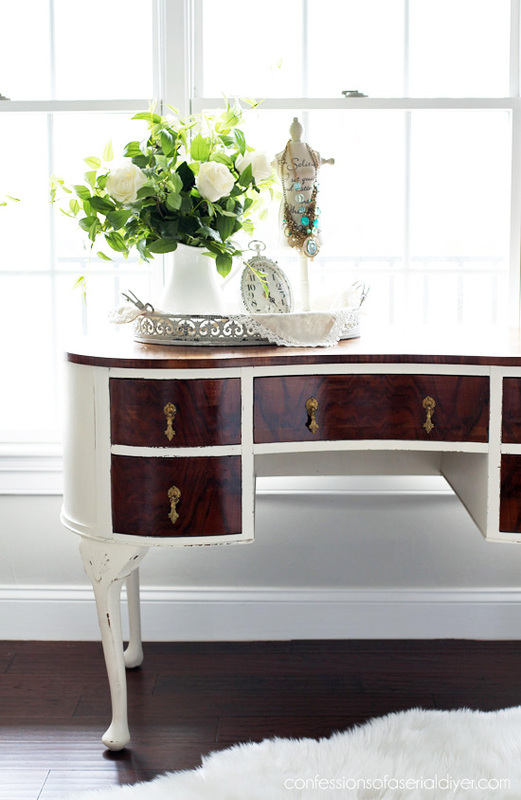 Both pieces are delightful and will go with many styles of decorating. You are spot on with pricing the pieces separately, that’s what I always do unless the chair is really specific for the desk. I have sold several chairs similar to these and they go speedily out of my booth. Great job moving these into the twenty first century of decorating. You used the existing cushioning and went over it but I have chairs that need new padding. 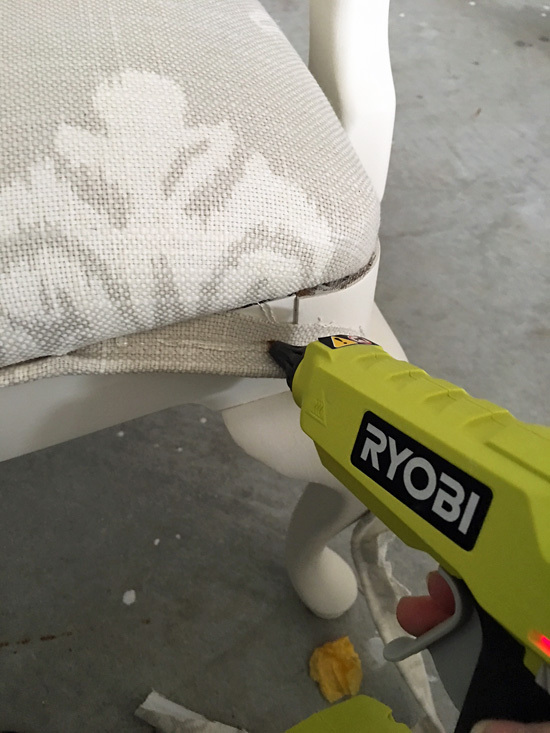 This post led me down the rabbit hole looking at chairs (and everything else along the way) to find what you recommend for padding replacement. My old chairs have cotton batting which aside from Not being able to find, isn’t very comfortable. Any suggestions? Much appreciated. Thanks, Peggy! I always try to reuse what is already there if it is good condition and because cost is a factor when I’m reselling these pieces. 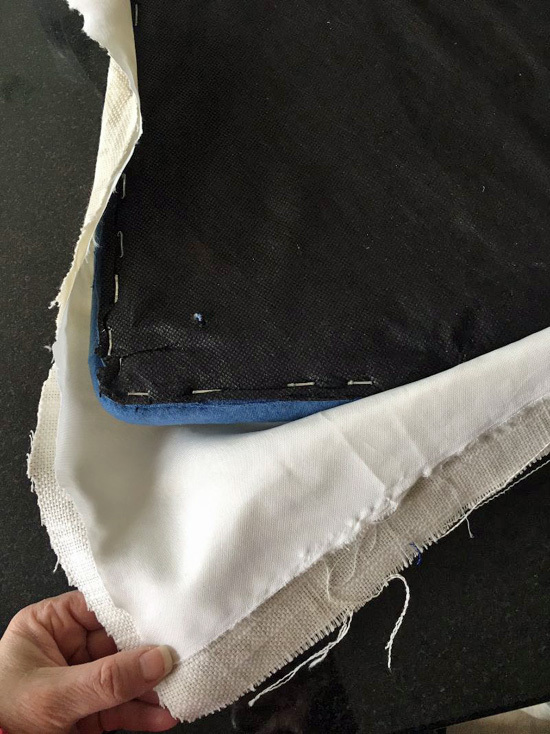 However, if the old padding is not in great shape, I would recommend one inch foam you can purchase at JoAnn Fabrics, followed by a couple layers of batting, also available at JoAnns. You can use regular old quilt batting. Hope this helps! What a great job you did on that chair. And how lucky you were to find it for $10. I don’t know where you live, but here in California that chair would be at least $50, even at GW. Another beautiful job on this wonderful set. 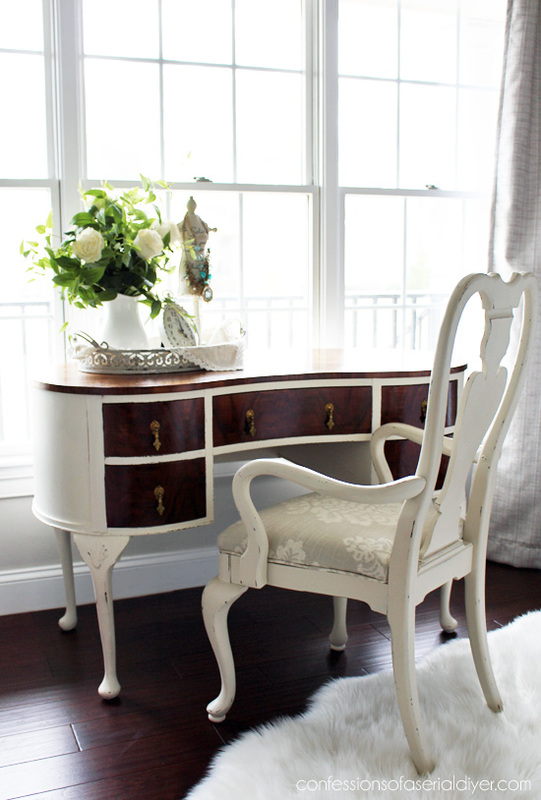 Love the chair and the desk! Great idea for attaching the piping. I learn something new every day at your site. We used to have a Hancock Fabric near us, but they closed. I miss that store. The chair looks great! Hopefully they will sell together. I’m going to check out Lowe’s blackout shades. We need new one for the bedroom. Christy , Hello ! A long time admire of yours. Try to follow you as often as I can . Your whole house is decorated like a pro ! love .love love it ! 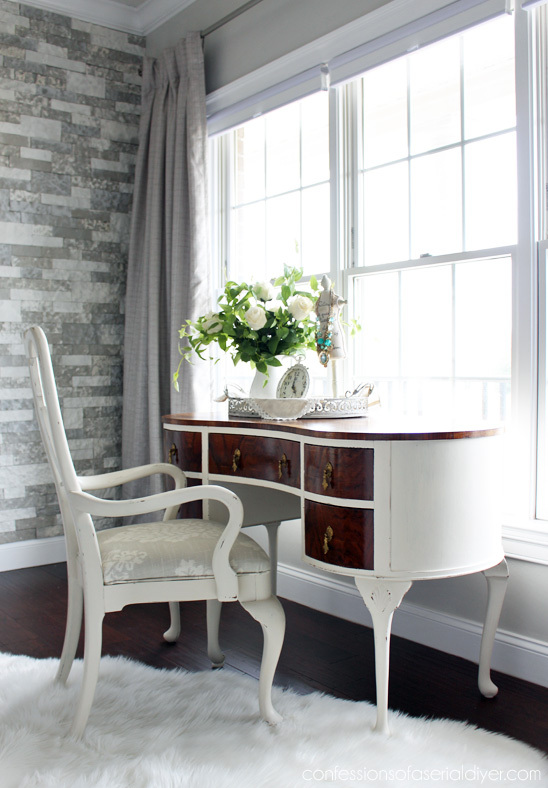 What color walls did you paint in your room that your office is in ? I am in the stage of picking out warm light grey’s for my living room /open to our dining room and am finding it hard to fine just the right grey that also will go with my oatmeal color carpet I have . I would love to install hard wood . My carpet is fairly new and have to work with what I have . Wow, it really looks so much better painted! Love the fabric you used on the seat. They should both sell quickly! that you do. 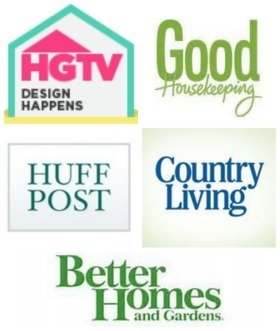 I look forward to seeing the reveal of the hutch that you will post soon! You are so talented and thank you for sharing the inspiring pictures and details, every time I receive an email from you with tour latest projects I can hardly wait to see The pics and details. 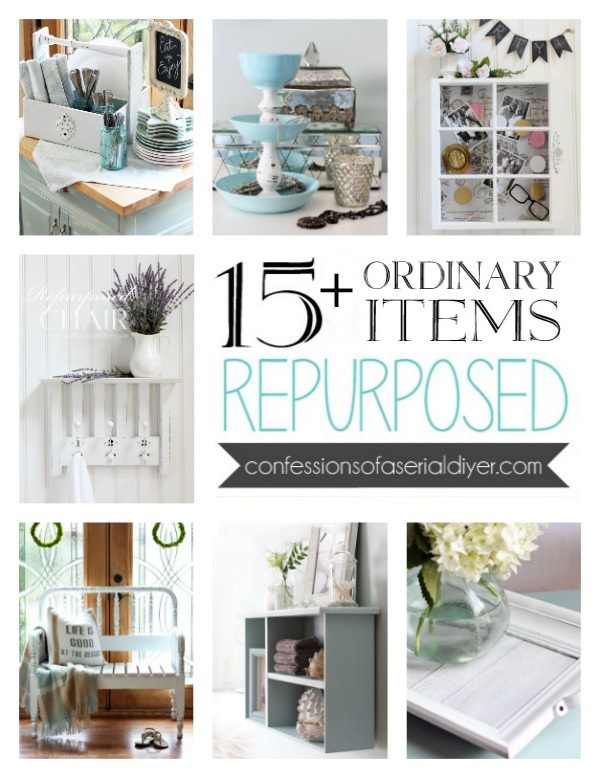 Please continue to share your how to’s and pictures of your treasures, again it inspires a thrift store junkie like me! So pretty, Christy! I think I need something like this for my living area! On the look-out now! 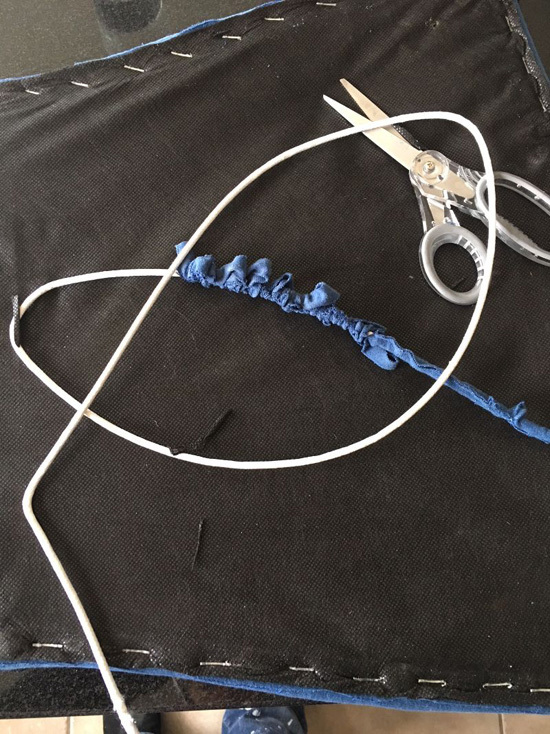 I enjoyed your post about the chair and learned somethimg new😃 I never thought of recycling cording! How clever! I am following your blog but find it very annoying with the bar at the top taking up room. It is to sign up for your posts but since I already have, it is dostracting. Just want you to know. I look forward to future posts. Thanks for your response! I just saw the “beachy” lamp and it is adorable! You mentioned that you would have painted the lamp black so I’m wondering what type of paint would you have used? I only have problems with the bar at the top when I am using my cell phone but it is no problem on my computer. Hi Christy! I’m new to your blog this afternoon. Love your projects! Very informative. I have a question. 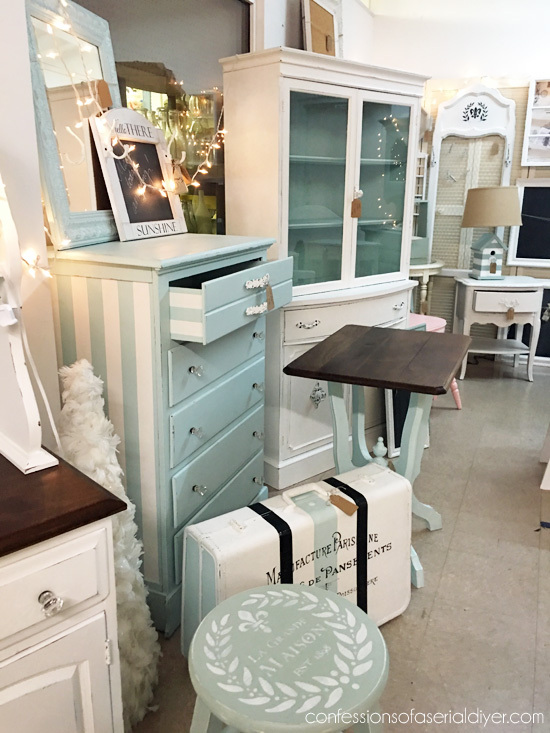 I’d like to do my kitchen table in aqua and white. 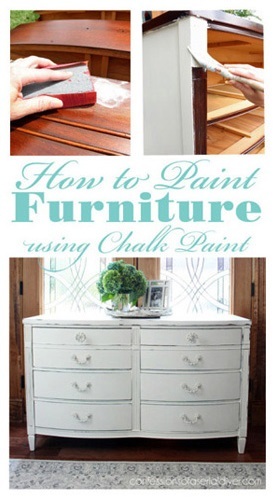 I will use the Rustoleum white that you recommend but I don’t see it in aqua. Can you help me find an aqua colour that would go with the white? Great blog! Hi Gail and welcome!! I don’t recommend spray paint for a large surface like a table top as it is hard to get an even result. My first choice would be stain and Home Depot has an aqua stain that I have always wanted to try that might be awesome! I believe it is made by Varathane. Maybe that is an option for you?